R&A Architecture + Design designed the offices for corporate investment firm BCG Digital Ventures, located in Manhattan Beach, California. R&A Architecture + Design reimagined traditional open-office models to create an innovative and flexible workplace for the new North American Center for BCG Digital Ventures located in Manhattan Beach, CA. The design is intended to emphasize the integration of, and collaboration among, the client’s three operational disciplines: product design, digital engineering, and business strategy consulting. By conceiving a new, flexible space design and organization, R&A created an adaptable template to fit a variety of floor plates. Manhattan Beach is the first of several locations; offices in New York, Shanghai, Sydney, and London are in the planning stages. The client’s core disciplines form project teams of varying sizes from initial research and inception, to product development and commercialization. Integrating the three distinct disciplines and fostering collaboration among them was crucial to the design scheme’s success. 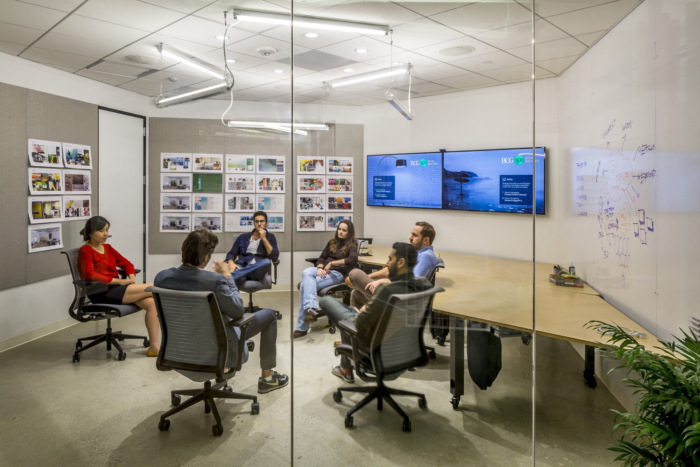 Business consultants and strategists traditionally show a need for dialogue and interaction thus—based on working style—smaller private breakout rooms can emerge. Designers require ample workspace and wall space to display design options, and engineering teams require more permanent, personal, and quiet workstations. The open floor plan breaks down into smaller, semi-enclosed team “villages,” allowing six to 12 desks for an optimal collaborative environment and larger project spaces. These project spaces, known as “Venture Rooms,”are hexagonally shaped to maximize wall display space and enhance team collaboration around a moveable and customizable organization of diamond-shaped tables. The non-traditional room shape encourages natural collaboration in a circular, non-hierarchical arrangement.The Venture Rooms are clustered along an internal meandering “beach walk,”a nod to the local beach culture, that orients the rooms toward natural daylight, yet shields the workstations from distractions and passersby. In the heart of the space, “Townhall” serves as a social gathering place, encouraging various informal working and gathering scenarios. The communal layout allows for a variety of activities, such as dining, events, and lectures. Townhall features sofas with adjustable laptop mounts, picnic tables adapted with USB and power outlets, and a steel pipe grid on the ceiling equipped with audio/visual and lighting equipment to further enhance the utility of the space.